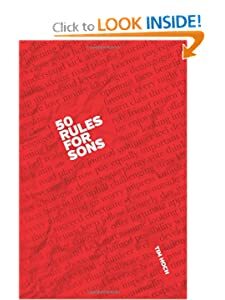 Perfect for the attention span of the 140-character generation (think Twitter), 50 Rules for Sons dispenses rapid-fire chunks of wisdom in the first half of the book, independent of any explanation. But each “rule” has a backstory, which Tim Hoch explains–sometimes eloquently, other times bluntly, and almost always with some wit. These backstories, are located–well–at the back of the book. There are plenty others–but theses were the ones who resonated with me. And I am not even a “son.” Which goes to show this little book could be valuable for just about anyone. It’s written in a straightforward, down-to-earth manner we can all apprciate. I plan to send them to new grads on my list this spring….so go on and…Seize the day! And now for the give-a-way! Got a grad on your list who would benefit from 5o Rules for Sons? Let me know by dropping me a line/making a comment on this blog post. Tell me in 50 words or less what makes this young man special. It will enter you into a drawing for a complimentary copy of 50 Rules for Sons! Contest runs now thru Friday, May 17th at 5pm. You will be contacted via email if your name is drawn. Books will be mailed to you shortly thereafter. Open to US residents only. Good luck! TIM HOCH has practiced law in Texas for more than 20 years. He lives in Fort Worth with his wife and three children where he serves as Vice Chair for Catholic Charities-Fort Worth and is on the Board of Directors for Frog Club at Texas Christian University.He is also a volunteer at The Assessment Center and Child Advocates of Tarrant County, two programs that assist abused children. He is working on his next book,50 Rules for Daughters. You can follow Tim’s blog here. My two sons are such special gifts from God. Daniel, my oldest is quite a charmer. He is very compassionate,gifted in academics, sports, and all kinds of musical instruments. His curiosity can get him into trouble. Mathew, my youngest is very determined and he has a unique talent for art of all kind. He is a strong, sensitive type of boy who tries to hide his kind heart. His toughness can cause strife at times. They are both a handful and loved very much. They know this also and I am learning patience in my journey with them as their mother.